A man laced the atmosphere of a Baltimore theater with menace when he began shouting "Heil Hitler! Heil Trump!" during intermission of a classic play set in a Jewish village in czarist Russia. The patron's outburst during a Wednesday night production of "Fiddler on the Roof" sent panicked people running for the exits. Rich Scherr, a technology and financial journalist who was one of over 1,000 people attending the Wednesday night performance at Baltimore's Hippodrome Theatre, said a man seated in the balcony was behind the commotion. He described stunned audience members initially freezing in confusion and fear when the man began shouting minutes into the intermission. "Everything just got really, really quiet. And then I heard this guy screaming: "Heil Hitler! Heil Trump!" he said in a Thursday phone interview. Other patrons told him they also heard the man yell about "MAGA," President Donald Trump's "Make America Great Again" slogan. A few dozen people started running for the exits, according to Scherr, while others began calling out for security. Scherr said he braced for the possibility of gun violence in the packed theater. "You don't want to think the worst, but I was preparing to react in case of gunfire," he said. In a police report made public Thursday evening, hours after the story made waves, police said the man told officers he was actually motivated to shout out salutes to Hitler and Trump because of his disdain for the president. Officers said the man, identified as Anthony Derlunas, 58, told them he'd been "drinking heavily throughout the night." Law enforcers found he was not a threat to public safety. The theater scare comes a few weeks after a gunman fatally shot 11 people inside a Pittsburgh synagogue. The suspect in that shooting, Robert Bowers, 46, expressed hatred of Jews during the rampage and later told police that "all these Jews need to die," authorities said. It also comes days after the FBI released a report showing a 17 percent spike in U.S. hate crimes in 2017 —with a 37 percent increase in anti-Semitic hate crimes. In a tweet, Jonathan Greenblatt, the chief executive officer of the Anti-Defamation League, responded to a Baltimore Sun article about the Wednesday night incident, describing it as "yet another sign that these are not normal times." 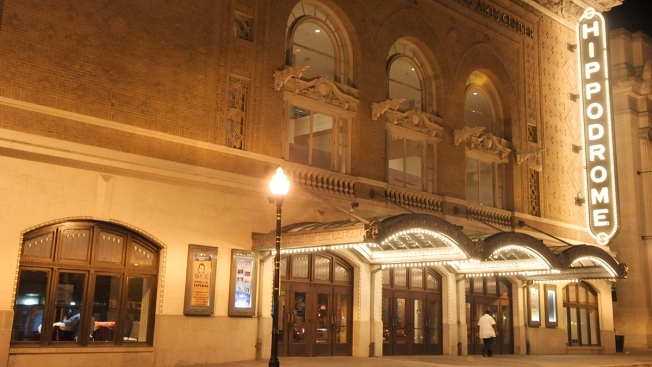 After several minutes, the offending theatergoer was escorted out of the Baltimore theater by security and the show continued without incident after the intermission ended. The Baltimore police said officers did respond to the Hippodrome at 9:40 p.m. Wednesday, but no arrest was made and the man was allowed to leave on his own. "Though reprehensible, the man's words are considered protected free speech because he did not directly threaten anyone," said Matt Jablow, a spokesman for the Baltimore Police Department. Whatever the man's intentions, police will be posted at the Baltimore theater for performances through Sunday. The Hippodrome Theatre said behavior "like we saw during intermission" at Wednesday evening's performance would not be tolerated. They said their security coordinated efforts with city police who met the man as he was escorted out of the building. "Our venue has a proud tradition of providing shared experiences to people from all walks of life, right in the heart of this wonderfully diverse city, and we intend to continue that tradition in the spirit of bringing people together, not dividing them," the Hippodrome's Thursday statement said. "Fiddler on the Roof" is a bittersweet musical revolving around a poor Orthodox Jewish milkman, his rebellious daughters and other community members of a village in czarist Russia, and their faith that is tested by progress and repression. Set in 1905, it's based on stories originally written in Yiddish by Sholom Aleichem. The original Broadway production in 1964 starred Zero Mostel and had an almost eight-year run, offering the world such enduring songs as "Sunrise, Sunset," ''If I Were a Rich Man" and "Matchmaker, Matchmaker." It's long been a staple for schools and community theater groups.